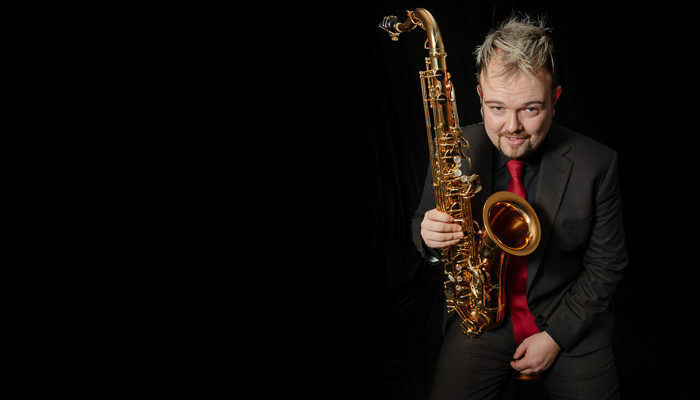 Sax player Dan is one of the most charismatic saxophonists on the UK scene. He studied in London and New York, and has been mentored by Grammy award-winning saxophonist Branford Marsalis. Dan has recorded 12 albums under his own name and is an expert on the music of John Coltrane and has been invited to speak about Coltrane at various events across the world. He wrote his thesis on A Love Supreme whilst studying at London School of Theology and regards Coltrane as ‘the complete musician’. Dan has an active performance schedule, both with his own group and others. He is also the current saxophone tutor for Cambridge University. Sax player Dan teaches students both at Cambridge University and in his own private practice. He performs across the UK and Europe with his own jazz trio and other projects. He is a member of the King Cave Project and ‘Passion’, a innovative fusion of dance, poetry and music. Dan performed with Pop artist Yazz on a number of occasions. He made a number of recordings and live appearances for the Hed Kandi label and Nightclub saxophone, under the pseudonym, ‘Sax Man Dan’. Dan started playing the family piano as soon as he was tall enough to reach the keys. He took up his Dad’s clarinet when he was seven. A change of schools led to a change of instrument – when Dan was ten he moved to the saxophone. Not long after his 16th birthday, he started touring the UK and Europe with The Amazing Blues Brothers Soul Revue. He then went on to perform around the North West and further afield, both with his own group and other jazz ensembles. Dan was the Director of Jazz Studies & Music Technology at the Sir Thomas Beecham Music School at Rossall from 2002 to 2005. A conversation with Branford Marsalis following a performance at the Royal Northern College of Music in Manchester in May 2003 led to an invitation to study with Branford and visit New York. When he returned from New York, Dan moved to London where he studied Music & Theology at the London School of Theology, focusing on John Coltrane’s A Love Supreme. Whilst in London Dan studied with Mike Haughton, Tony Woods, Frank Griffith, Chris Redgate and Steve Gregory.